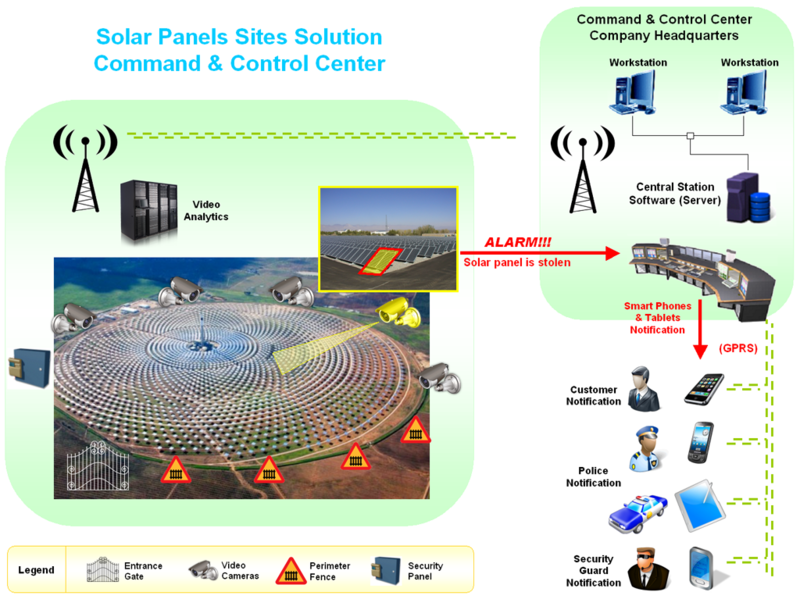 Solar Panels Sites Solution answers the emerging needs of security solutions in solar panels sites worldwide. As we all know energy resources on the planet are limited; oil and natural gas will be finished one day. New technologies for utilizing sun energy to produce electricity are being developed to answer that need. However these solar panels sites are convenient targets for those who seek to disrupt and cause damage to them. Solar panels sites are spread across the country, but a single Command & Control Center can provide multiple panels sites’ security needs. Mega-pixel video cameras are installed around the solar panels sites, a digital perimeter fence surround them, and a video analytics server processes the captured video. In addition, detectors are connected to a security panel. All security relevant data is collected and sent by wireless means to the Command & Control Center, where system operators immediately deal with emerging security needs in real-time.